Well, well, it's Monday again! It always comes back around so fast doesn't it? Especially when you have a pretty good weekend? Oh well. It's here and we deal with it! Inspiration Monday always takes the sting out of Monday. Today we have Michelle Williams and I'm seriously coveting her jacket. It's amazing. I did not use a jacket like that for my outfit. That's ok. I adore Michelle Williams - she inspired me to cut my hair when I first went to a short pixie. I think it's so sweet that she keeps her hair so short in honor of the fact that Heath Ledger loved it on her. But anyway - here's her look. And now here's mine. This was worn for Friday's workday and then date night with the Pants Monkey after. We're finally getting a taste of Fall weather here in Minnesota, so the jacket was kind of a necessity! And I might not have an awesome jacket like Michelle's, but I love my blazer. I don't remember when I bought it anymore, but it has gotten a lot of love from me! So Friday night we went out to an Irish restaurant that we enjoy. We sat outside and I was even more thankful for the jacket at that point, it was getting a wee bit chilly! I was halfway tempted to convince the Pants Monkey to start a fire in our firepit when we got home, but instead we cuddled up inside with a movie. We watched The Big Year with Steve Martin, Jack Black and Owen Wilson - it's actually quite good and it's only rated PG, rather clean, so even some kiddos might like it. They play birdwatchers. Quite entertaining. The rest of the weekend was pretty awesome as well. We got out and golfed with my parents on Saturday morning and I was happy that I can still swing a club pretty well right now! Doesn't mean I played well mind you, but it was a beautiful morning anyway. Headed home and my dad and the Pants Monkey did some more of the nitty gritty work on the window before it started to rain (finally! We've been in such a drought!). I headed out to have a girls night with the fabulous Lori and Cambria (more on that later this week). And then Sunday we went out with my in-laws to start looking at cribs (! ), found the one I think we'll be buying, then had lunch with them. Went home and worked on cleaning out little man's room some more and then made a yummy dinner of stuffed peppers from our CSA. So overall, it was kind of one of those good weekends that was a mix of work and play and it felt pretty darn nice! How were your weekends? What's new? 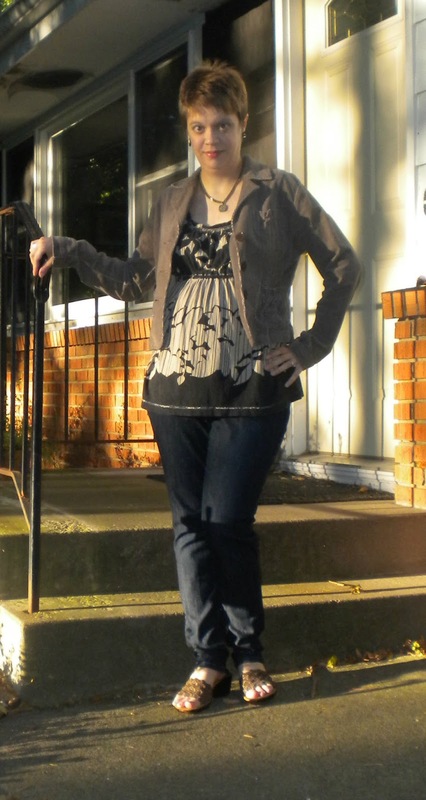 And of course, don't forget to head over to two birds for more Inspiration Monday outfits! That is a really cute outfit! Sounds like you had a busy, but productive weekend! I'm glad you had a good weekend! I really like that top - it is really cute on you! We had a really good weekend too. A nice mix of work and play as well. Crib shopping - so excited!!! I can definitely see why you love this blazer. It's a great color and can go with so much! The "little man" -- ahh! I can't wait to meet him! :) Also, if you are coming on Sunday, I am going to bring your box of stuff? Oh Bethie, this ensemble is great on you. Sounds like you are always up to something around there. I have wanted to see The Big Year, thanks for the reminder. Sounds exciting! I I love this look! You are making me want more blazers! AND stuffed peppers! I think your jacket is pretty awesome! And wow, crib shopping! I've actually already picked mine, but we won't be buying it for a few months now. Love the blazer Beth:) Sounds like you had a great weekend! Your top is so great, I think it's so pretty. I also love Michelle Williams. Once, I brought her photo in to a hairdresser for him to copy. And it IS super sweet that she keeps it short in memory of Heath. Are you going to share photos of the baby's room? I'm thinking about it, but it might cross the line of oversharing for me. Ooh! Stuffed peppers! I love peppers... more than they love me. But yes, Michelle WIlliams jacket is 100% covetable. To the point where I might be on eBay looking for a similar one! Great outfit! LURV the top. So cute! Just a really fun print. Don't you love that this weather?! Sounds like you guys had a nice and relaxing weekend after a crazy end to a week!